A Spring in my Step after a Winter Break! As many of you will know in the middle of a busy period of clients and family commitments, the Universe decided to step in and give me some time to myself. I would not recommend ignoring those whispers that say, slow down you need time to think and reflect as eventually they become a loud yelp. In my case it manifested in a spot of pavement surfing and a broken arm! Still it has been a wonderful "break" in many ways and allowed me to consider what I want to do that will allow me time to develop myself and at the same time continue in my work and enjoying a social life. There is something rather wonderful about being dependent as it allows you to receive and see how much love and care there is surrounding you. It also helps you to realise that a lot more can be accomplished by better time management. So I have decided to dedicate 3 days to work and the rest of the week to my wellbeing and happiness. I also will be taking time out to travel and enjoy life and planning retreats as I feel I can achieve more for those attending in a group setting. We never know how much time we have or what is around the corner and it has strengthened my belief that life is for living and doing the best you can. So now I am back in the saddle and it is wonderful to be sharing healing and experiences with everyone again. I am loving the coming of Spring and have had time to take walks in the parks to see the beautiful blossoms on the trees and carpets of daffodils and bluebells which just expand my energy and fill me with a sense of everything being right in the world. Walking in nature is so empowering and rejuvenating. This year has been exceptional after all the rain and the aromas of azaleas and other flowers has felt like wafting into the garden of Eden. I am looking forward to visiting my sanctuary in the nature of Bulgaria and walking along the beaches and absorbing the energy of the mountains, forests and sea. The skies are so clear and the stars so bright that it is easy to feel connected to the oneness. The full moon spreading its light over the sea at night is beautiful and I love the sound of the ebb and flow of the waves as it sounds like the breath of the ocean and earth. The rhythm of life courses through everything. I have been attending some very interesting workshops and meeting other healing and self development practitioners. It is always lovely to be a part of a group as the energy is amplified and healing seems to come easier. I attended a Gary Manion Healing Workshop last weekend - which along with my work with Young Living oils, massage and visualisation has further eased my shoulder joint and taken my arm movement a step further. I am also attending some fantastic workshops facilitated by Loran Northey at the Maple Leaf Clinic in Twickenham on a Wednesday night at 7pm where she is running an Anxiety Busting Club. This month I am attending a crystal healing and meditation workshop as well. I am hoping to run a retreat later in the year for anyone who is looking to do some inner work and clear any old unwanted patterns and to move on and expand their consciousness and awareness for self healing. Do contact me if you would like to attend, also if you would prefer a weekend or 5 day retreat. I am looking at October and it will be in the UK for those looking to save air fares. Thank you for the wonderful weekend of Vitaflex and Raindrop therapy. Your commitment to us, your students, your craft and the oils as well as creating a warm, accommodating and safe environment is very much appreciated. I was very happy with your willingness to share your knowledge. Overall I found my learning experience with you enriching and I I am certainly looking forward to my next level with you. I would recommend this course to other people interested in the Raindrop Technique. So not only are we delighted with the results of the oils for clients and students, but Suzanne is presenting talks and workshops in Jersey next week and we have also been invited to visit Italy and present some talks and workshops in the Autumn, just prior to promoting our work at Kempton Park this November at the Holistic Mystic MBS Show. You can keep up with our news at www.raindroptrainingeurope.com. 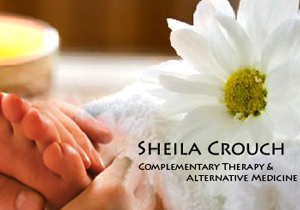 If you would like to experience a Raindrop Technique or any of the other treatments I offer or attend or arrange a talk or training please do contact me at www.sheilacrouch.com. You can also order Young Living Therapeutic Essential Oils either quoting my No. 1360228 direct from the Young Living GB website or office. All very exciting! Is it any wonder I have a spring in my step!